Mark and Annalise are looking at the Erinsborough News and Mark asks if she isn't angry that they're making her out to be some kind of bimbo. Annalise thinks it's a cute picture; she's only annoyed that they've called her Anna Louise Hartwell! She thinks a little bit of publicity is good. Philip comes in from organising paper deliveries and tells Julie he's not crazy. Julie still can't understand why he wants to throw away everything he's worked for. Julie wants him to speak to Janet Harper the family counsellor. PHILIP: She might be able to get me in touch with my feminine side. PHILIP: My feminine side. I read about it yesterday. We get all those new age magazines in. To lead a fuller life you have to be in touch with your feminine side. JULIE: I'll see if she can fit you in today! Pam offers Gaby some breakfast but she feels sick. Pam tells her she should eat something and Cody asks what's wrong with the two of them. She asks Gaby what she got up to last night as she looks shocking but Gaby says nothing. Cody wants some sisterly advice about Michael putting the hard word on her. Gaby snaps that Cody is far too young and runs to throw up. Doug is buying some home interior magazines and one about babies. He claims he picked it up by mistake. Annalise buys more copies of the Erinsborough News and Philip tells her that the photo looked good. Annalise tries to take the high moral ground. ANNALISE: You know they didn't even ask me if they could put it in? Talk about invasion of privacy. Diana, she gets her photo taken in the gym and the whole world's up in arms. What about the ordinary person? I think we should draw the line somewhere. PHILIP: Just the four copies?! A bag of clothes Gaby had sent as freight has arrived and Pam tells her she shouldn't be carrying that. Cody wants to know if there's something wrong with Gaby as she was throwing up earlier. PAM: If you want to know the truth ask her. And if you get a decent explanation come and tell me! 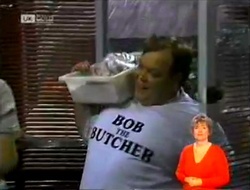 Bob the Butcher (it's written on his t- shirt so we know who he is) delivers some meat and tells Annalise her picture in the paper was sensational. He asks how she would feel about representing Bob's Butchery for the Miss Erinsborough charity quest. Little Piggies Hams and Small Goods have got Susan from the Waterhole! Janet Harper arrives for a session with Philip. Philip says he felt like a gear change but Julie says it's more like throwing your life into reverse. She wants Janet to tell him it's madness. Janet says it might be better if she speaks to Philip on his own. Helen says she's heard about Annalise being in the paper. ANNALISE: Helen, tell me, what are your thoughts on beauty contests? HELEN: I can honestly say that I haven't had any thoughts about beauty contests for more years than I care to remember! Annalise tells her about Bob's idea. Helen thinks it might offend people. Annalise mentions Lucy's modelling but Helen says it's a very difficult career. Annalise decides to do it and is glad she spoke to Helen. Helen looks a little puzzled. Cody comes to see Gaby and asks her if she's sick. Gaby tells her she's pregnant and Cody can't believe she could be so dumb. Gaby says she doesn't need a lecture. She wants the baby and it doesn't mean she can't have a career. Kristy looks on as Annalise cuts her picture out of the paper. Julie has joined Helen and hopes Janet will see that Philip needs serious help. 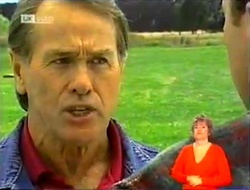 She gets the idea of a health farm but Helen tells her to wait and see what Janet has to say. Julie jumps up to go home; surely they've had enough time now. Julie returns and Janet says they're finished. Philip kisses Julie and leaves for the shop. 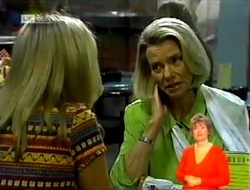 Janet tells Julie she doesn't consider Philip to be sick. He made a mistake not consulting Julie but his plans are well considered and reasonable. Julie insists he's had a breakdown but Janet doesn't agree; Philip is a different man to the one she met when their marriage was in trouble. Julie isn't happy. Doug has arrived and Gaby tells him Cody knows about the pregnancy. Cody wants to know who the father is. Doug still thinks it's Stefano but Gaby says it's not. Doug says it must be Jack Flynn in that case and Gaby's face confirms it. Bob returns with some flowers and a kilo of rump for Annalise! Annalise tells him she's going to have to turn down his offer. She's going to enter the contest but representing the coffee shop. Bob tries to sign up Kristy. BOB: I'll throw in an extra kilo of snags. KRISTY: Gee Bob, you know how to make a girl feel special. BOB: Oh, I like to be competitive. KRISTY: Yeah well, sorry to disappoint you but I'm a vegetarian. I couldn't ethically do it. BOB: Not my lucky day. Oh well, there's always young Carly down at the abattoirs… she might be in it! Kristy tells Annalise she's not really a vegetarian but there's no way she's being in any beauty contest. Julie is moaning to Helen about Janet's assessment of Philip. HELEN: I thought you agreed to abide by the arbitrator's decision? JULIE: Only if it was the right one! Even if Philip isn't crazy he's still being totally irresponsible. She thinks he should be at Lassiters protecting Helen's investment. Helen is sure they will find someone. Annalise hasn't had a chance to pick a film for tonight so Mark goes to have a look in the paper but finds four of them. He tells Annalise to keep them for scraps as they're only good for garbage but Annalise tells him some people thought it was quite good. She tells him about Miss Erinsborough and Mark says he won't let her do something so demeaning. Annalise refuses to be told what to do. Julie enters sheepishly and Philip tries to give her a grand tour. He says it will be a family business but Julie thinks he's deluded; Debbie is too busy, who knows what Michael's plans are, Hannah is too young, and Julie has no interest in working in a shop. She storms out again. Pam has now arrived as well (not much work going on today). 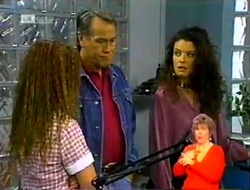 Gaby tells her and Doug she's told Jack Flynn and he doesn't want to know about the baby. Doug says he's not going to get away with this but Gaby doesn't want him involved; they know what kind of man he is. Doug arrives and confronts Jack. Jack doesn't know what he's talking about. Doug pushes him against his plane and says he's got half a mind to take him apart.